Size: 59 x 141 in. (150 x 358.1 cm). one of the pioneers of Chinese contemporary art movement and the leader of the “Political Pop” movement. •Wang has created his own brand of paintings and sculptures based on heroic images borrowed from the Cultural Revolution. In the 1980s, he created a sensation in Beijing by challenging standard portraits of Mao. He painted the Chairman behind a set of grids or boxed lines, hinting at a needed re-examination of the Chinese leader. For more than two decades Mao Zedong’s portrait was ubiquitous throughout China. The official emblem of the Great Leader’s cult of personality, Mao’s image presided over schools, factories, committee halls, and, of course, Tiananmen Square. •The first Mao portrait appeared in Tiananmen Square in 1949, replacing Chiang Kai-shek’s after the Communists seized power and founded the People’s Republic of China. In the intervening years, several versions of Mao’s visage presided over Tiananmen, each executed by the then-reigning official portrait maker with the help of anonymous artists. Even today, Mao’s portrait remains above Tiananmen as the figurehead that unites the Communist Party and the People’s Republic of China. Despite his mixed legacy, his image serves as a powerful touchstone for millions of Chinese citizens. 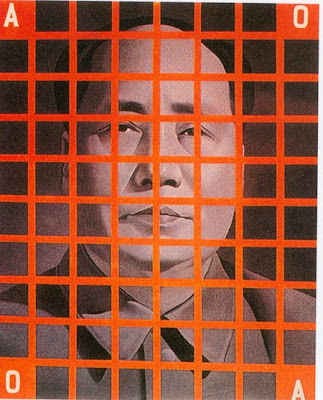 In a 1999 Art Journal article, Francesca Dal Lago cited political pop artist Wang Guangyi's 1988 Mao Zedong — Red Grid No. 1 as one of the first examples of the "Mao-related phenomenon in painting." caused a sensation at Beijing's first exhibition of avant-garde art in 1989. Political pop artists such as Wang are ambivalent towards what has become the foremost icon of an entire Chinese generation. the grid:,imposes a precise, mathematical structure on the image, stands for rationalism. •a gray version of a famous image of Mao, which the artist set within a grid of imprisoning lines. •The color not only shocked eyes accustomed to years of reddish hosannas to the father of the revolution -- that gray can shock at all is wittily revealing -- but seemed to bleed the meaning from the ideology itself. The letters A and O, represent nothing more than coordinates in a random system, much like the ticker-tape flurry of numbers stamped across his Great Criticism paintings. Which one is better in fulfilling the purpose?Why? It also unthinkably implied Mao’s imprisonment or, at the very least, an insurmountable barrier between his revered image and the gaze of the worshipful masses.